The public crab dock on the south side of the bay in Newport, Oregon can be a fun, shallow dive at high tide. We have found sunglasses, lost crab pots, beer bottles, golf balls, wallets, keys, and the occasional fishing pole in the water under and around the crab dock. It is a good idea to have a friend stay on the surface and stand near your bubbles to help calm the nerves of any recreational crabbers who might think that you’re trying to steal their crabs. It should also be pretty clear that it is a Bad Idea to steal crabs out of someone’s crab pot or for that matter to even try crabbing here while on SCUBA. The public crab dock on the south bayfront in Newport, Oregon is a fun place to dive although you need to watch out for people throwing stuff on you if they suspect you’re stealing their crabs! The main highlight of this dive site is exploring under and around the dock for lost sunglasses, hats, wallets, keys, crab pots, fishing poles, and whatever else people have lost over the side. Visibility is always low and sometimes you can’t see anything at all. It is a shallow dive meaning that you can stay underwater poking around for a very long time if you want to. For people who want a little navigational challenge, you can head out to the Yaquina Bay Bridge footings to see what there is to see. However, we can’t advise you do this because we are pretty sure that somehow you could be charged with terrorism for getting too close to the bridge without permission! Take the aquarium exit from US101 and follow the signs to Rogue Brewing and Brewers on the Bay. There is a big public parking lot right by the crab dock. There are bathrooms and there is a fish cleaning station at the west end of the parking lot. The Newport crab dock is a fun little dive but be mindful of people above and watch out for fishing line. The crab dock runs roughly north-south. Stick close to the piers and you can’t lose your way too badly. 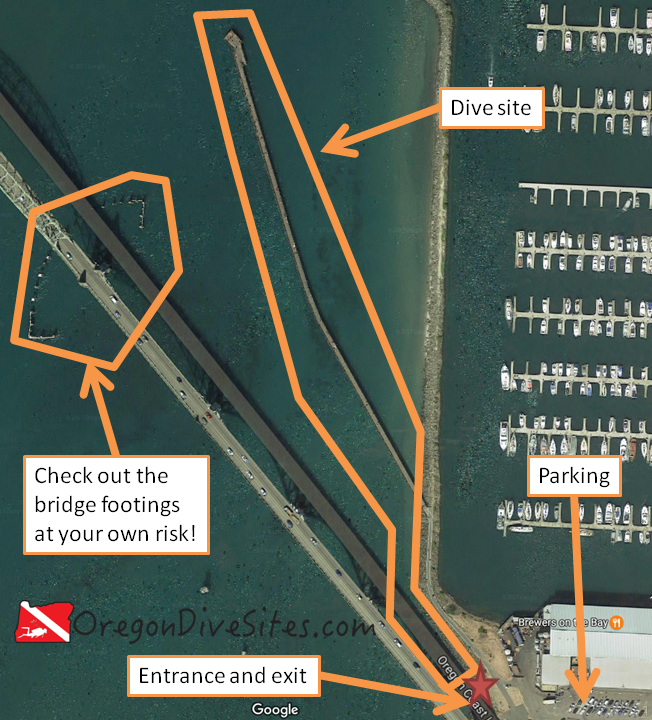 If you want to venture out to the Yaquina Bay Bridge footings, it can be a fun navigation challenge. However, we recommend against it because you could be charged with a terrorism-related crime! The entrance and exit is right by the car park. You will have to climb over some jetty rocks but there is almost never any surf or surge here. Wakes from passing boats can make it a little challenging but otherwise this is a much better entrance than what you usually find at places like the fifth finger on the South Jetty. Usually the water is fairly calm here. Wakes from passing ships can stir things up. Note that you can really only dive this site at high tide. Otherwise you’ll be walking around on mud flats rather than diving. Visibility is usually poor with a good day giving you 10 feet and a bad day giving you 0 feet. The bottom can be stirred up and cause a black-out situation. In that case, it’s probably best to surface, swim a ways, and then descend again. Excellent neutral buoyancy skills are a must here. 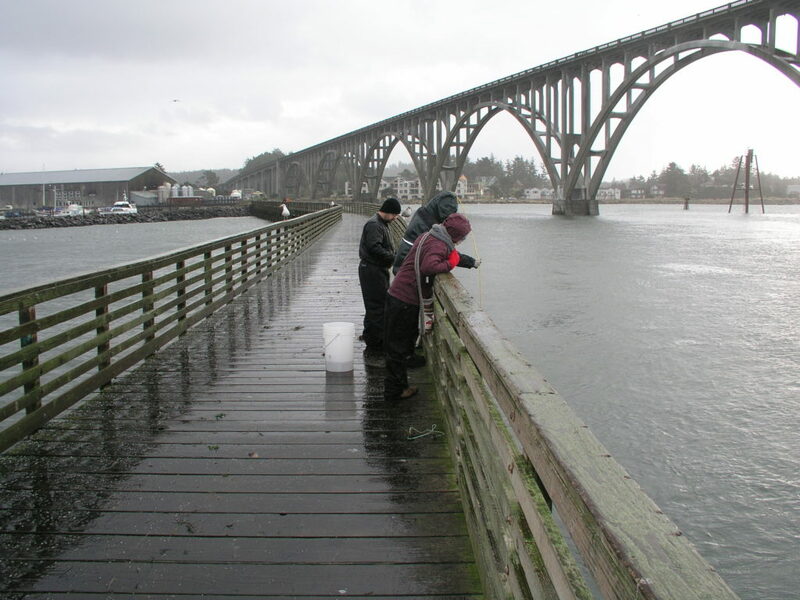 Water temperature varies by the season and by how much water is coming out of the Yaquina River and by the crab dock. We usually see between 45 and 55F at this site. There isn’t really a best time of year here. Instead, there are better high tides than others. Find a high tide that is very high so that you have some more water to dive in. At the very end of the crab dock on a very high tide, you can hit 25 feet. Most of the dive site is more in the 10-15 foot range. Most dive computers won’t even start logging a dive at that depth! Open water divers can dive this site if you are okay with the entrance and you know what to do if you get tangled in fishing line. We strongly recommend carrying a dive knife and a safety shearer. We have our favorites that we carry on every dive over on our Gear We Use page. The dive itself is pretty easy. The entrance is a little tricky with having to climb over some jetty rocks and the risk of entanglement in fishing line is big enough that we rate this as an intermediate dive. About a 100 foot walk is needed to get to the entrance. Technically you can start diving right away but we recommend surface swimming at least to the start of the crab dock before you descent. Figure on a 250 foot surface swim at a minimum. If you dive this site at anything other than a high tide, you will be swimming in mud flats rather than actually diving. We highly recommend having a friend stay on the surface and monitor your progress from the crab dock. Recreational crabbers and fishermen may have a few nasty things to say and a few objects to throw at your bubbles. It’s a good idea to have a friend along to smooth over any frayed nerves and reassure them that you aren’t stealing their crabs! Also you might make a friend if someone has lost something over the railing and you can find and retrieve it. We highly recommend taking along a mono-filament (fishing line) cutter. You are almost guaranteed to run into some underwater. We have our favorite knives and safety shearers over on our Gear We Use page. In the South Beach area of Newport there is a local dive shop that does air fills, repairs gear, rents and sells gear, and can give additional info on local dive sites. Right next to this dive site there is a great brewery and restaurant. Otherwise on the other side of the bay there is a whole street of good food. 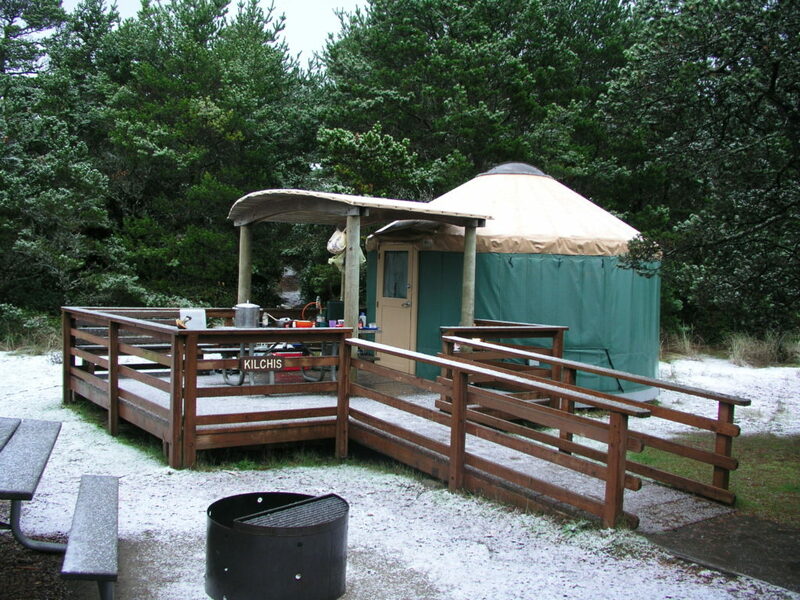 South Beach State Park has good camping and some great yurts for rent. We stay here frequently when we visit Newport. We haven’t stayed in any hotels in Newport yet but if you know of a good one that is SCUBA diver friendly, let us know!